You see, I discovered the existence of a website called Predict that enables cancer specialists and their patients to enter in specific data about their cancer, press a ‘Predict Survival’ button and gain insight into their expected rate of survival for five and ten years past diagnosis. It was never going to end well, that Google session! I don’t know what I really expected, and upon reflection, I’m not sure what baseline I would have been happy with. Nobody really wants to see that their chances of dying within ten years are less than ideal. I knew all that, but the part of me that yearns desperately for good news, or even just for concrete answers at a time where there are so many unknowns, was too strong. I had to know, whatever the outcome. Once all this is entered, it spits out your probability of kicking the bucket in 5 and 10 years time. 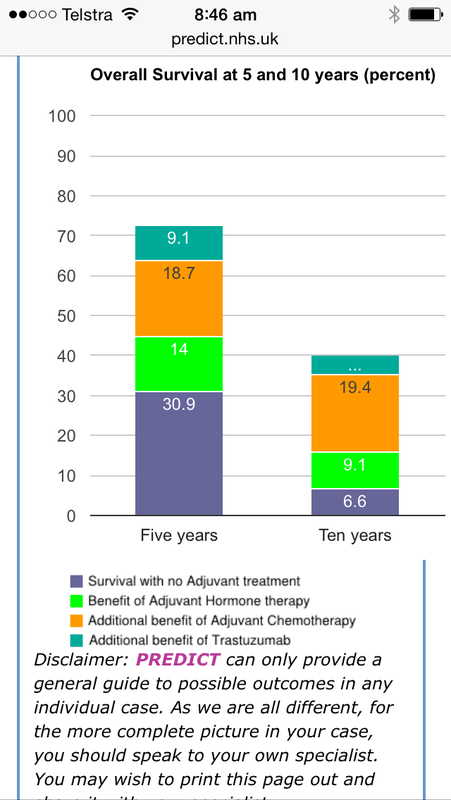 Just over 70% chance of survival at five years, dropping to 40% at ten years. Not really the best way to start an otherwise sunny, happy Thursday, huh! For starters, these statistics are at least ten years old, and are based on the stats of all sorts of women, using no further details than age and the pathology results of their cancer at diagnosis. Predict can only ever be a general guide to possible outcomes and cannot reflect an individual’s specific case. I have to keep telling myself I am young and strong. Prior to diagnosis I was fit and pretty healthy. I have a lot in reserve to help my treatment succeed. And treatment-wise, I am in great hands. My team of doctors is world-class and the drugs I am receiving as a part of the KAITLIN Clinical Trial include some brand spanking new therapies that are designed to target my cancer specifically. This is why I’m so passionate about helping to fund cancer research, because without it the odds would be stacked even further against me. Breakthroughs in cancer diagnosis and treatment are made all the time through research, and it is the new, more targeted therapies that are in trial now that give me a surge of real hope. Can I ask each of you a little favour? Would you relinquish one or two morning coffees this week, and instead throw the coins at cancer research? My friends are fundraising for Breast Cancer research through the Mothers’ Day Classic this year by completing a run and asking their friends and family for sponsorship. Jay and I and our children have signed up to walk it and I would be so pleased to translate that into some tangible support for the National Breast Cancer Foundation. If you would like to read more into why funding research is important, you can do so here. Thank you so much (in advance) from the fullest part of my heart! Now get out there and enjoy that sunshine! Glad you’ve turned your Thursday around in such a positive way. I agree grace- how the heck does something like predict exist?! Not helpful at all in my opinion!! Nope. No more. Ever. Unless it’s for letterbox research.